The fate of 24 miners remains unknown. A methane explosion led to the collapse of the rock in a coal mine in Lviv Region. The 2 March accident killed at least eight people and injured six more, the State Service for Emergency Situations has reported. "We had 172 people working in the mine, including 34 miners at the emergency site. 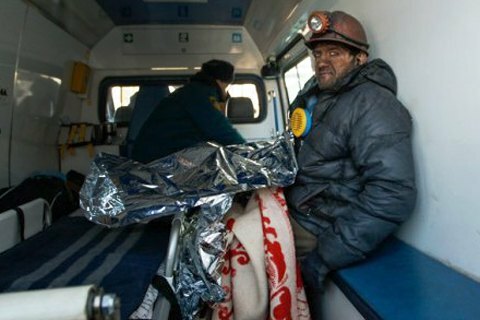 Eight were killed and six miners with injuries were brought to the surface," reads the statement. The fate of 24 miners remains unknown. The explosion caused the collapse of the rock at 12:46 Kyiv time. The special crews of the Energy and Coal Industry Ministry and the State Emergency Service are involved in rescue operations. Prime Minister Volodymyr Groysman, Energy Minister Ihor Nasalyk and SES head Mykola Chechotkin are working in the operational headquarters on the scene, according to Groysman's spokesperson, Dmytro Stolyarchuk. The head of the Lviv regional state administration, Oleh Synyutka, said that the government commission believes that the blast was not caused by the works aimed to boost production volumes in the mine. The ad hoc commission will see whether safety regulations were violated, he told 112 Ukrayina TV. He ruled out that the accident may have been caused by an increase in coal production. "On the contrary, we did not increase the volume of production compared with the previous times. However, we have certainly been getting ready to increase production because of the blockade in Donbas." The state-owned mining company Lvivvuhillya runs seven operating mines in Lviv Region. The mine No 10 Stepova (formerly Velykomostivska), located in Hlukhiv, Sokal District, was opened in 1978. It was designed to extract 2.4m tonnes of gas coal a year.